ForeverLawn Inc. provides the most advanced synthetic grass products on the market in terms of realism and technology, backed by superior service and support. ForeverLawn’s synthetic grass is ideal for a range of applications where aesthetics and functionality matter, including sports fields, playgrounds, kennels, and more. 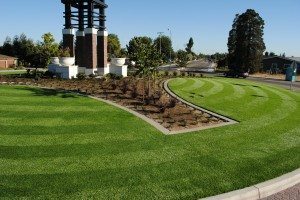 Their industry-leading synthetic turf is also perfect for homes located in arid climates where water restrictions dampen natural growth as well as for residential and commercial applications looking for low maintenance but beautiful landscaping. With unmatched quality and service, ForeverLawn continues to expand and now has offices in more than 29 cities servicing 30 states and two countries. ForeverLawn recognized that an opportunity to reach potential customers online was going unmet with their current website and marketing strategy – and decided it was time to step up their game. They wanted their website to generate the leads, supported by successful inbound marketing, that they knew were possible for their growing industry and with their extensive dealer base. ForeverLawn hired Sanctuary to redesign the website and to overhaul their online marketing strategy with a focus on connecting with a broader customer base and generating more quality leads – while decreasing the cost to do so. Because ForeverLawn services most of the country through a large network of local dealers, generating traffic and leads through localized search optimization was an ideal solution. We started by targeting the Cleveland, OH region with keyword-rich landing pages targeted to specific locations and featuring the appropriate ForeverLawn dealers. Optimized local landing pages also must persuade Internet shoppers to take further action – in ForeverLawn’s case by submitting an online form requesting more information or a quote from a local dealer. We also significantly decreased ForeverLawn’s pay-per-click ad spend in an effort to help them get more “bang for their buck” through instead growing their organic (and free) search traffic. We began local search marketing for ForeverLawn in July of 2013. We set aggressive goals for the campaign – and exceeded them. After a year, ForeverLawn’s organic search traffic grew by 25.77 percent with 11,872 more visits from local searchers than the year before. 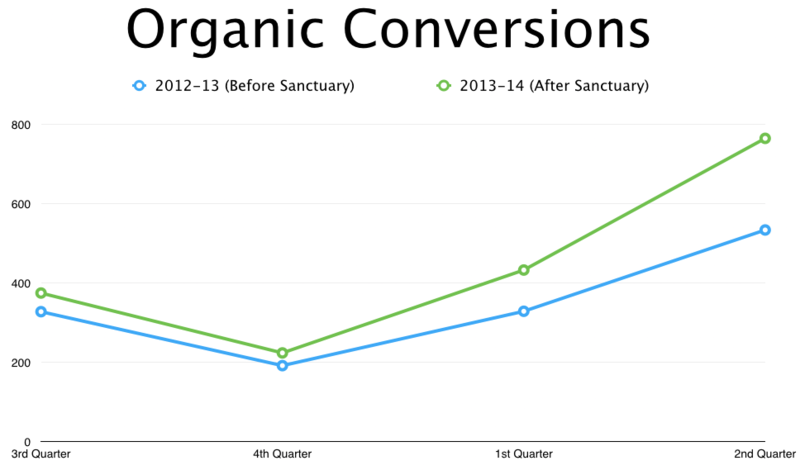 Even more importantly, conversions from organic search visitors (ie. leads generated) increased 28 percent compared to the previous year. After a year of local search marketing, ForeverLawn’s dealer form completions by organic search visitors are up by 36 percent. And these metrics continue to improve month after month. And currently, overall website conversions have increased 24 percent with the focus on organic search optimization. Do you want to see results for your local business like ForeverLawn has? 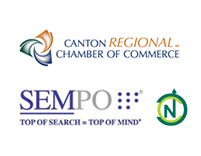 Let Sanctuary design a local search marketing campaign for your company. We tailor our marketing strategies for your unique business and audience – and we only count a campaign successful when you see the difference in your bottom line.